The Club launch will operate from the London Landing at weekends and Bank Holidays from Friday 19 April to Sunday 27 October 2019. The Coxswain is Barry Elliott who is responsible for the launch at all times. The launch is a strictly No Smoking vessel. 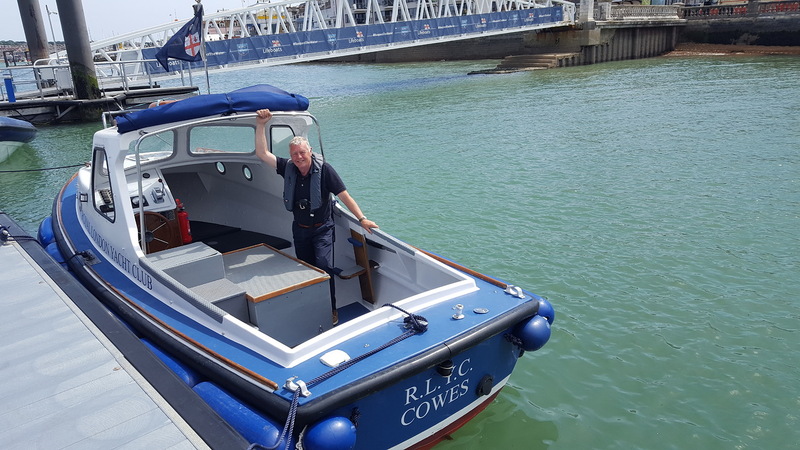 The launch will not be available for trips to upriver pontoons in the hour prior to the start of the Solent Series racing (Saturday 1300 – 1400, Sundays and Bank Holidays 1200 – 1300) and for 40 minutes after the first Daring finishes and returns to her mooring (approx. 2½ to 3 hours later) and is ready to disembark. Outside these times the launch will be available to all Members on a first-come, first-served basis. On RLYC Regatta days the Race Committee has priority use of the launch if required. The launch general operating area is bounded by Medina Wharf south of the RLYC upriver pontoons to No.2 Harbour Buoy. This area may be extended to respond to emergencies or at the request of a Flag Officer, the Chief Race Officer or the Sailing Secretary. Members may use the nominated Water Taxi providers below directly between a mooring or upriver pontoon and the Trinity Landing upon production of their Club membership card, on Fridays evenings and weekends outside the above hours of the Club launch. The Member can redeem the fare with a valid receipt at the Club Office within 7 days.